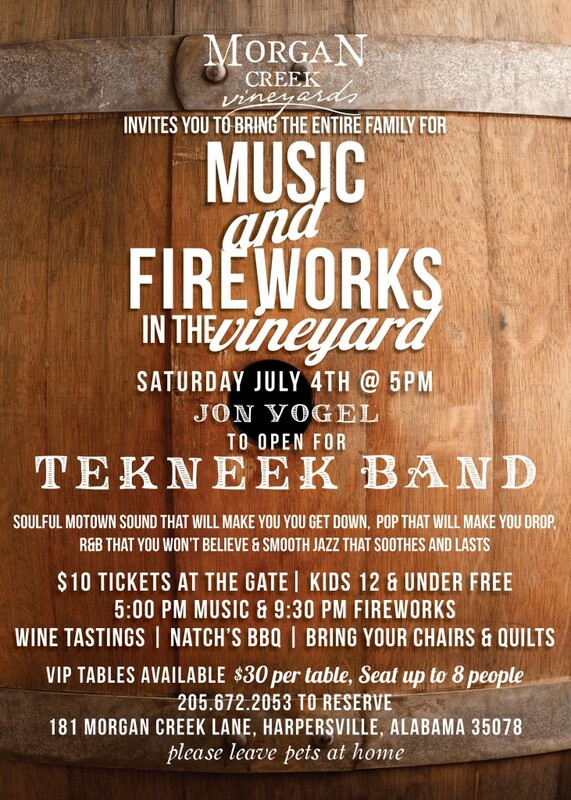 Morgan Creek Winery » July 4th at the Vineyard! Join us in the vineyard this July 4th for a dynamic concert event. Enjoy wine tastings, winery tours, BBQ and spectacular fireworks! Special opening music begins at 5:00 p.m. The soulful Tekneek Band starts at 6:00 p.m. and fireworks will wow at 9:30 p.m. Bring a blanket and chairs for the perfect spot in the vineyard. $10 per person at the gate and ages 12 & under free. VIP tables are available for $30 per table and seat up to eight people.